I have been so out of touch the last month that I only tonight found out that we’ve lost Sabrinaa Nightfire, SL artist, patron of the arts, and generally wonderful person. Here is a nice posting on the Prim Perfect weblog about Sabrinaa and her passing and various ways her less out-of-touch friends have remembered her. I will just post a few pictures. 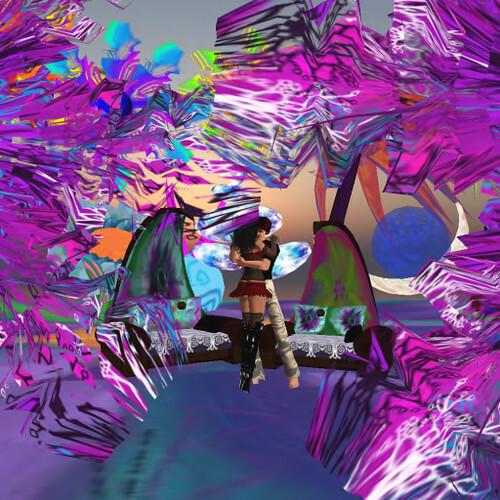 That’s Sabrinaa dressed all festive at her Peace and Love Oasis build at Burning Life. She made big colorful things, things that made you happy just to look at. And she was all about peace and love and health and all that kinda stuff. She made all sorts of artworks, and not only displayed them, but also randomly dropped copies on her friends. Clothes, flowers, sculptures, solid frames full of interesting things. These were done for some “Illusions” show. Left to right, I think they are called “Illusions Just for Fun”, “Illusions of Time”, and “Illusions of Love”. Utterly fitting, writing this now, that she herself is in the middle one. She was great at prodding me into actually making things. :) Here’s the last thing that I made for one of her challenge shows. It was for “Black and White and Red All Over”, which I don’t think she ever quite had a chance to open (unless I was just offline and missed it). It’s called “The Red Ball”, and I’m very fond of it. And I will think of Sabrinaa every time I see it. I think I’ve figured out why I so often disagree with Hamlet Au‘s opinions about how Second Life should change. As I speculate here, I think Hamlet is talking as an investor or a business consultant, saying what he thinks will improve new-user signups, or retention, or profitability in general; whereas I’m talking as a resident, saying what I think would make the world a better place to be a resident in, for people who are at least to some extent like me. Of course the world has to continue to exist :) in order to be a good place to reside, so I am somewhat concerned with profitability, but it’s not primary. So for instance when Blue Mars decided to give up development of the actual virtual world, in favor of an “is my AV hot or not?” app for cellphones, that may have been a great decision in terms of bottom line, but presumably was not great news for those who enjoyed the actual virtual world. And when Hamlet praises the new “Rank” system on the Second Life official forums, and hopes that it will soon have an equivalent inworld, I think he means that he believes (based on his knowledge of similar systems in places like the 2.5D Habbo Hotel (“Habbos Like: army cool diceplaya elite police force financier football friends fun funny habbo habbo government job justin bieber lol love music nypd pays police white house”)), that this would increase new-user retention, concurrency, profits, etc; but when I say I think it would be an awful idea, it’s because I have a really hard time imagining how such a thing would actually improve my experience of the world, aside from any profitability impacts it might have. I remember when I briefly tried “vSide” awhile back, there was some system of “Creds” or something, based on something like a ranking system or achievements or friends or money spent or something, and various items that I might have wanted to buy were only available if you had enough “Creds”, and I didn’t. And this turned me off, and was one of the reasons I stopped going there; one thing I don’t want a virtual world telling me is that I Am Not Good Enough! On the other hand I do appreciate the value of a constant little stream of validation in any activity. 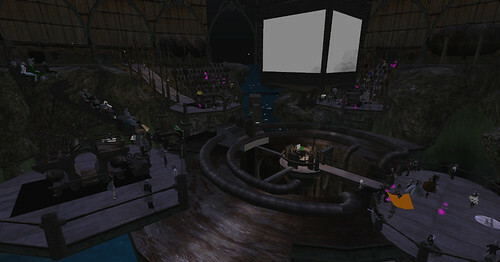 So maybe it would be possible to imagine some sort of “Gamification” of SL that would, rather than telling you that you are currently Not Good Enough to get some particular item or upload some particular kind of content, instead give you little attaboys, little blips of praise or accomplishment. Might be worth thinking about. World of Warcraft has (at least) two almost entirely separate reward and rank systems, one of which I think is completely inappropriate for SL, and one of which might actually be interesting. The inappropriate one is the obvious one: every character has a level, and the most obvious driving force behind the entire game is leveling up. You level up very very fast at the beginning, which provides a steady stream of little rewards to start with, while you’re still perhaps finding out what-all there is to do in the game. Low-level characters can only go to low-level places, and use low-level items, and fight low-level monsters. A high-level character can kill a low-level character of the other faction with a single blow. Importantly, it’s a ranking system among characters (“toons”), but not among players; in general each player is expected to have a number of toons, and the level 15 druid that you’re talking to is quite likely just the latest toon of someone who also has two or ten level 85 characters of other classes and races. And this would all be completely inappropriate for Second Life. SL isn’t about some ubiquitous overarching story that everyone is taking part in, some set of predefined ladders that everyone goes up and that everyone is interested in. It’s not about creating a character, leveling it up one of the available ladders, improving one’s gear, and then starting a new character with different abilities, to climb a slightly different ladder. SL can be this, if you get into one of the RP systems, but that’s entirely up to the player; it’s not baked in. And it shouldn’t be; changing SL to be that way would be like making it into an “is my AV hot or not?” app for cellphones, or for that matter into a sales platform for dishwashers. It might be profitable, but I (and I think most residents) would lose all interest. On the other hand, WoW also has the more recently-added “Achievements” system. Achievements are things that you do outside of the level system, and that get you at most little decorative rewards, like a new title to display over your head, or a pet that will follow you around but doesn’t actually do anything in the game. And the vast majority of achievements don’t even do that; it’s just another achievement that you’ve achieved, the game makes a cool little noise and informs anyone standing nearby and anyone in your guild who happens to be logged in at the time, but that’s it. There’s a “compare achievements” mechanism that you can use to compare your achievements with those of anyone nearby, but I don’t think I’ve ever seen or heard of anyone using it. Could we have a similar system in SL? Maybe. It wouldn’t be like the thing on the forums at all, with every person having one single rank-like title (“Honored Resident”, “Member”, “Advisor”, gak); instead there’d just be alot of checkboxes that you could either ignore entirely, or work more or less hard on getting them checked off. Having checked off alot of them would not get you any special powers on the forums or in the world. I can’t emphasize this strongly enough; tying them to special powers leads to cheating and hacks and drama and destruction. And so on and so on. :) Most of those are newborn sorts of things; I think I’ve done all of them but “create a group”. Another alternative grid that’s been getting some talk lately is Avination. It’s another OpenSim grid, technically pretty stable from my small amount of experience there, with a functioning currency system, and a couple of interesting potential differentiators (i.e. 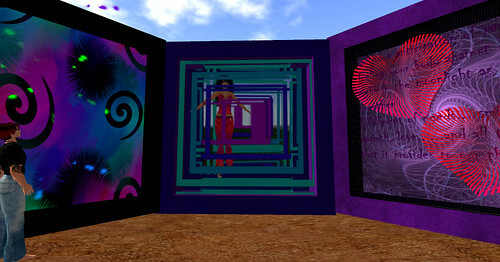 things that might make it different enough from Second Life and from all of the other OpenSim grids to be notable). The first differentiator, which I won’t mention outside of this sentence, is gambling; they haz it. The second one is their novel and as far as I know unique Freebie Policy. Or, as it might also be called, their anti-Freebie Policy. The Freebie Issue is another one of those controversies that I’ve studiously avoided in weblogifying about virtual worlds. The issue has enough facets and subtle nuances that it would take a whole essay to treat well, and on the other hand lots of people seem to have strong one-sentence opinions on it; not a great combination. Personally I like it when people share stuff, and I think it’s healthy for an economy in general when in order to make a buck you have to work harder and/or have better ideas than the people who are producing stuff just for fun. On the other hand I do understand the argument that store-provided freebies are a sort of Tragedy of the Commons thing: that sellers would do better if none of them gave out freebies, but if anyone does, then in order to stay competitive you have to also. I suspect that the argument is true in some sectors, false in others, and irrelevant in others; but it would take significant work to get any good data on which are which. Anyway, Avination comes down on the negative side of the issue in various ways. When you land at an Avination starting point, there are no boxes of free AOs, no stores giving away free “better than newb anyway” clothing. The Freebie Policy says “No Freebies may be given out in stores at the welcome areas”. And since you start with zero money, that means the only way to even walk like a person is to invest in the world. It’s an interesting thought; they are counting on there being enough people who already know that they want to be in the world, and will be willing to put down cash before they’ve really experienced it. Not only can there be no freebies in stores at the welcome areas, no store can have more freebies than it has non-freebies, you can only give away freebies that you made yourself, and no freebies can be copy-transfer. This led me to wonder just what they mean by “freebie”. The Policy seems to define them as “promotional gifts”, but just what does that mean? Is something that costs $1 (in the local currency) not a freebie anymore? What if I make something and want to give it away full-perm just for fun, not “promoting” anything but maybe my reputation for generosity; is that still a freebie in the relevant sense? I posted that basic question as a thread on the Avination forums (which has since moved): does the Freebie Policy forbid me, as an individual rather than a store, from giving anything away full-perm? The Freebie Policy does in fact apply to individuals just like it does to stores. Which is pretty radical, really, if true. It’s not necessarily bad, but it’s a large departure from Second Life (differentiator, see? ), and suggests a really significant outlook on the world: that this isn’t a place where the vision includes people randomly making and sharing things, modifying and passing them on, etc; on the contrary it’s a place for buying and selling, where the amount (and perhaps indirectly the quality) of stuff is carefully reined in. The rules about what you may create and what you may do with your creations are founded on the needs of commerce, whether you yourself intend to be commercial or not. Not my kind of place, described that way, but nothing requires it to be. I think it will be interesting to see if it is lots of other people’s kind of place. And I think that’s about all I’m going to say on the subject tonight. :) Personally I like the sharing culture, where people make stuff and pass it around full-perm, or at least copy-transfer, and it passes from hand to hand forever. I probably like lots of stuff that the Avination people would consider low-quality (and when they say “freebies that no one wants” I have to admit what I hear is “stuff that isn’t to my taste and therefore should not exist”). On the other hand I don’t like copybotting or copyright violation; and on the third hand I’m not sure that freebies or full-perm things have much if anything to do with that. I’m tempted to post a bunch more questions to that forum thread; about whether dollarbies count as freebies, about what the minimum price you have to charge before something stops being a freebie is, about whether it’s allowed to sell things copy-transfer (hint: for big sectors of the economy, like poses and scripts and textures, it pretty much has to be), and so on.